It’s the time for biggest temple festival of kerala, live pooram 2018 will be available through different malayalam television channels. every year all the major kerala tv channels airing the live telecast of thrissur pooram festival. it’s an annual kerala temple festival conducting at vadakkumnatha temple thrissur. 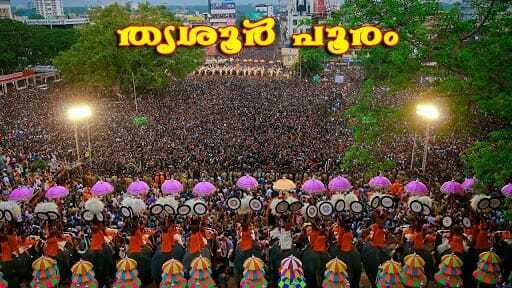 2018 date for pooram is tomorrow and every year millions of people enjoying the same directly and through television. this is the most important and popular cultural festival of kerala. pooram date is usually coming in April or may month, pooram star of malayalam calendar medam. There are 2 sides of participants in pooram festival, Western Group and Eastern Group. These groups are known as are Paramekkavu Vibhagam (Side) and Thiruvambady. fireworks, caparisons, elephants, kudamattam, Ilanjithara Melam etc are the attractions of this temple festival. Sakthan Thampuran, who ruled thrissur is behind this cultural event. Pooram festival starting with kodiyettam aka Flag Hoisting. The kodiyettam will happens seven days before the pooram date. All the participants of this event will attend the pooram kodiyettu ceremony. There will be limitation to fireworks now a days, fireworks was one of the major attractions of this temple event. Amrita tv every year carrying live pooram coverage, dd malayalam aka dd4 is another malayalam channel showing Thrissur Pooram 2018 Live. Other channels like Kairali TV, Asianet News, manorama news etc showing the same on 25th April 2018. You can watch the event by visiting official youtube channels of these tv networks. Amrita tv available through yupp tv, dd malayalam now getting through zee5 application. Those who installed zee5 app on smartphones can watch pooram 2018 live through dd malayalam channel.